hello! 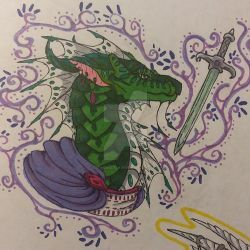 im lovecatsanddragons, i hope you like my profile! The Auction ends one day after the last bid. Its a cult of dragons who believe the three moons are what house three gods, Somewhat like giant eggs. Woohoo! 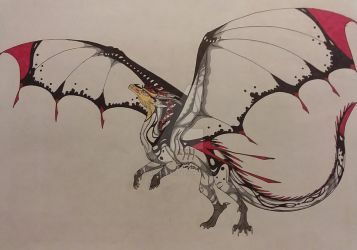 my First adopt up for bid or buy. Points or paypal is acceptable. I would prefer points though. If you want to use paypal, you can only use the autobuy options. Please pay up front for this adoptable. This will be open until someone wins the bid or buys it. YOU CAN CHANGE ANYTHING YOU WANT IF YOU PURCHASE IT. Tribe: Nightwing/Icewing/Seawing hybrid may have very distant skywing genetics. I soared around the island looking for food. I eventually spotted a wounded elk, wandering through the forest. i swooped down, grabbing the elk with my talons. i flew the elk back to the cave and snapped its neck. i saw that Azul was still asleep and i slapped him awake with a quick whip of my tail. "hey!" he said as he got to his feet and walked to the elk. we ate, and Then i walked to the Edge of the ledge and sat. I looked over the island, the sun was high in the sky. it beated down on the island. I could see the whole island, on the far side of the island, i could see an area that had lots of cliffs and hills. Perfect for flight practice The island mostly consisted of plains, with a few patches of forest here and there. I was going to explore it from above. I Opend my wings and lept from the ledge. i flapped my wings creating lift, and i rose high above the trees. i flew to the far side of the island. I Was Right! i could see young dragons learning how to fly. I tilted my wings, making me bank to the right, and i flew above the Plains, and then i flew to the north, past the peaks, it was Mainly Tundra. Ice Dragons Probably live here. I was right i could see figures of white and blue Playing in the snow. I Flew back to the cave, The sun was starting to set. I flew back to the cave and watched the sun slowly fall. Azul was Not in the cave "must be Hunting" I said to myself as i curled up and went to sleep. I had laid two eggs Their shells were hard and smooth. One was Decorated with the symbol of a cat the cat had red eyes, and the rest of the egg was a deep blue,The egg next to it was dark grey with light grey Stripes. Could it be!? 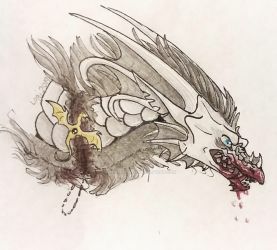 a tigerdragon... my mother told me tons of stories and legends, one was about how a tiger dragon egg is only lain every millennium I knew that tiger dragons could defend themselves when hatched but... a cat dragon, I looked at the other egg what if i kill it! what if i hurt it! I was barley myself anymore and i knew that would not be like my original self once they hatched... just before they hatch i will fly the cat dragon egg away, ill put it near Flame's clearing... but what will azul think... how am i supposed to tell him that i will not be like myself anymore, just walk up to him and try to explain that i used to be a flame dragon........... I wont tell him I felt myself begin to sob. I WONT TELL HIM!!! Tonight is the night... The night i will leave the catdragon egg. I have to tell Azul. I Was mean i growl i shout, i dont wake Azul with a gentle Tap, Ill fling my tail as hard as i can into his side. i wont hesitate to kill now. I grabbed the cat dragon egg with my teeth, gentely, i was about to take off when i get stopped by Azul "What Are you Doing!?" I had to make up an excuse other that just to say too keep it safe. I growled "CATDRAGONS ARE WEAK!" I did not face him "Im abandoning this.. this egg!" he snarled at me "WHAT! YOUR THROWING AN EGG OUT INTO THE COLD!!?" He faced me He bared His teeth"WHAT IS WRONG WITH YOU!" I felt a tear run down my cheek "SENSE WE'RE CATDRAGONS, I CAN UNDERSTAND BEING MEAN BUT THIS!" He snarled more "if your willing to do that to a helpless egg... THEN YOU"RE NO MATE OF MINE!!" He took Off Flying into the night, i set the egg down. "N-No! no! No! COME back! please! Im sorry! AZUL! Please!" i looked at my paws "w-what have i done! Azul... p-please come back" i felt my sadness turn into anger "catdragons...CATDRAGONS ARE WEAK!!" i was lying to myself. I grabbed the egg and flew above a tiny clearing near flame's and dropped the egg. i felt myself start to sob as i flew back to my cave, I cried for what seamed like hours, when i heard a loud CRACK outside I knew what it was... he has hatched.... Then i looked at the nest in my cave the tiger dragon egg was moving, then it opend with a loud CRACK as a tiny dark grey dragon with lighter grey stripes, red eyes with yellow irises, and a fin down his neck, fell out of the egg... i felt my bitterness rise. lovecatsanddragons has started a donation pool! These will have a longer turnout than others and are more expensive due to how time-consuming they are. please tell me if you want them looking in a direction or if you want a certain lighting or head pose. ARE NOT FULLY FINISHED LIKE EXAMPLES. They will be rough and uncolored or lined. ARE NOT FINISHED LIKE EXAMPLE, I HAVE NO SKETCHES UPLOADED. They are uncolored and rough. Once again, specify shading, poses are free, just describe what you want me to draw in detail. For your commissions, do you by any chance do customs? hey. it's me mysticquest from FA! Its alright! 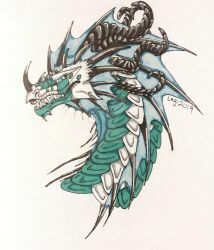 But im sorry, requests are closed for the week, because i plan to draw as many dragons from everquest that i can XD, but, ill let you know when they are open!